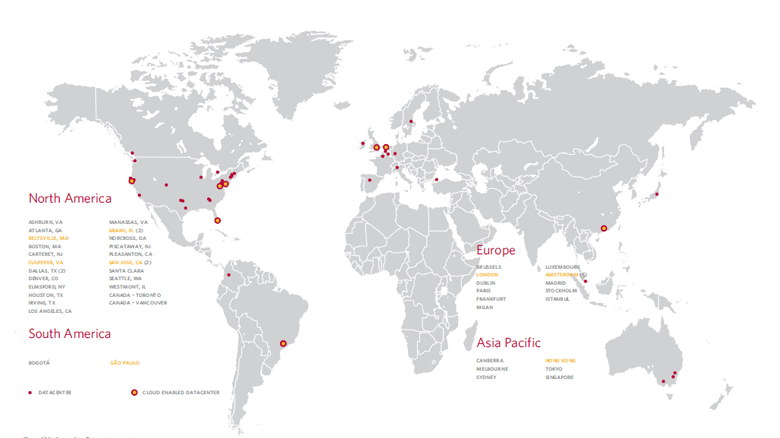 A global footprint of highly connected, physically secure datacenter facilities. Verizon Terremark’s Data Center Colocation Contact Us for Pricing! Terremark’s Colocation services offer customers controlled and managed datacenter space with myriad connectivity options to house computing, storage, telecom and application server equipment. Depending on customer requirements, open racks, cabinets, or customized caged floor spaces are available across a global footprint of hardened and secure facilities designed to withstand major environmental incidents. Massively Connected In addition to security and survivability, Terremark facilities offer choices and redundancies in communication infrastructure matched by few other enterprise-class colocation providers anywhere in the world. Many Terremark datacenters are connected to multiple domestic fiber backbones, undersea cables and over 160 carriers, providing customers access to virtually any location in the world. Colocation customers have the ability to contract services directly with carriers in Terremark facilities for the connectivity and redundancy they require. Additionally Terremark offers a Managed Routing Service (MRS) that leverages the massive global network connectivity provided by the world’s largest telecommunications companies located within our carrier-neutral facilities. With direct access to the backbones of these leading carriers, we consistently deliver optimal access to the Internet required for streaming multimedia, voice over IP and other applications. Physical Security Terremark’s physical security standards for datacenter facilities feature a centrally-located Command Center manned by security personnel 24x7x365. Security personnel monitor all security cameras, guard building entrance and exit access points, and control keycard access to elevators, floors and roof areas. In addition, environmental sensors notify tenants and mobilize rescue in case of emergency. Hybrid Capabilities Terremark has the ability to provide hybrid solutions that combine traditional colocation with cloud computing environments and managed hosting. Existing physical devices and private networks can also be integrated into cloud environments as needed. One size doesn’t fit all when it comes to IT infrastructure, and Terremark’s hybrid capabilities provide customers with access to various levels of support depending on their requirements. Raised floor: at least 20 inches above the concrete flooring. Raised floor loading: 150 lbs. per square foot. Loading docks, freight elevators and other equipment are available to assist with movement of customer equipment. Fully redundant commercial power feeds. Backup power provided by UPS or CPS Systems. 120v AC/208v AC/230v AC CPS/UPS-backed power available in standard increments. -48v DC CPS/UPS-backed power available in standard increments. Redundant cooling systems provide the ideal environment for IT equipment. Programmable, addressable electronic detection system of individual detectors connected to central control panel. Smoke detectors provided on the colocation floor, communication equipment rooms, mechanical and electrical rooms. Terremark’s RemoteHands SmartHands services assist customers that need remote access to equipment for performing simple troubleshooting or maintenance tasks. Our 24x7 staff can perform basic tasks that may require the use of tools or equipment. Terremark RemoteHands SmartHands services are available in certain locations on demand or by subscription in four-hour blocks per month. Terremark’s Network Operations Centers (NOC) serve as central command points for service delivery and oversee day-to-day operations within each datacenter. Terremark’s NOCs are staffed with personnel ready to assist customers with daily challenges and with skill levels that surpass industry standards. The NOCs are staffed 24 hours per day, 7 days a week. This “around-the-clock” staffing is instrumental in supporting customers on a global scale. 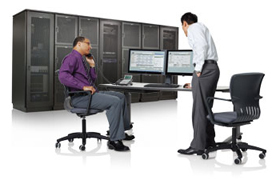 Download the Verizon Terremark’s Data Center Colocation Fact Sheet (PDF). DataConnectWorks.com is a division of Virtual Graffiti Inc, a Verizon Partner Program Silver Member.